Next month will be something of a milestone for me -- 40 years. No, not my birthday (I wish). It was forty years ago that I first donned the Red Suit. At age 8, I was picked to be Santa Claus in our third grade Christmas Play. I don’t remember how or why I was chosen for the role. Maybe it was just fate. I don’t even remember the title of the play or any of my lines. I do remember singing “Santa Claus Is Comin To Town” and vaguely remember that I played “Kris Kringle” and that no one knew that I was “Santa Claus” until the end. What I remember most from that day was everything happening before and after the play. I remember my grandfather showing up to help me get ready. He was there to glue whiskers to my face. I remember how itchy they felt. Once the whiskers were securely fastened, he then proceeded to spray paint my head white. I still remember the smell and the white cloud floating in the air. My Santa Claus suit consisted of a red snow suit, a black ladies belt (probably my mom’s), and my cowboy boots. I wasn’t too surprised that Papa was there to help me get into character. After all, when I was 6-years old he took me to the Rhode Island State House on St. Patrick’s Day to present the Governor with a pot of gold (chocolates). He glued a different set of whiskers to my chin that day and instead of white hairspray it was grey. After the play, I remember Miss Hallburg, my third grade teacher telling me how well I did and how proud she was of me. I remember there were a lot of people at our third grade production. There were lots of people there; people from the newspaper, relatives, and neighbors; and Papa talked to every one of them! He was like a celebrity! Of course, back then I had no idea then of my grandfather’s local fame or his secret identity. To me he was just Papa. But to everyone else he was Santa Claus. Today there is a street named after him and a bench with his name on it. The bench resides next to the dock where he would sit most days and welcome everyone offloading from the Prudence Ferry. An oil painting of my grandfather hangs near the entrance of our Town Hall as if still greeting visitors. Looking back I wish I had an opportunity to talk to Papa about being Santa Claus. It was only when he passed that I took up the role as Santa Claus full time. I like to think he is with me at my appearance or at least watching. You were born for the role. I know that your Grandfather would be very proud of what you have become and all that you have done for the Santa image. He was surely proud then and is now as well. Both you and your Grandfather have been role models for me to do better as Santa. Thank you for all thay you do. i love the stories you share about your grandfather. 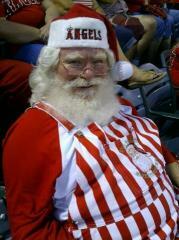 i also have a grandfather that plays santa, unforunatley i do not have contact with him due to some family issues. but i think this year i will break the ice by sending him a christmas card. i dont want to miss out like i did with my biological grandmother who pasted away 2 years ago. That's a cool story. One day you two will be reunited and you'll get to hear his side of the story. A wonderfull story to be my first that I read on ClausNet.